Gearwire interviewed John last week on the Marqui Adora recording process. It's a 2 part interview so check out both links below. A live acoustic version of I Walk For Miles has been added to our Web Freebies. Download it here by clicking the link below and choosing save. (Mac users can option click.) CLICK HERE! Fuzz.com is the new hotness. Recently we’ve found a new social network music site that shows a great deal of promise called fuzz.com and we think you should go and join up. It’s also a good place to buy new music so be sure to join and discover a lot of good music that you’ve never heard before. Be sure to add us to your favorites. 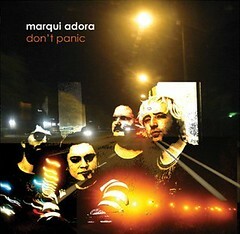 Visit: www.marquiadora.com to learn more about the band. The Don't Panic EP is finished!